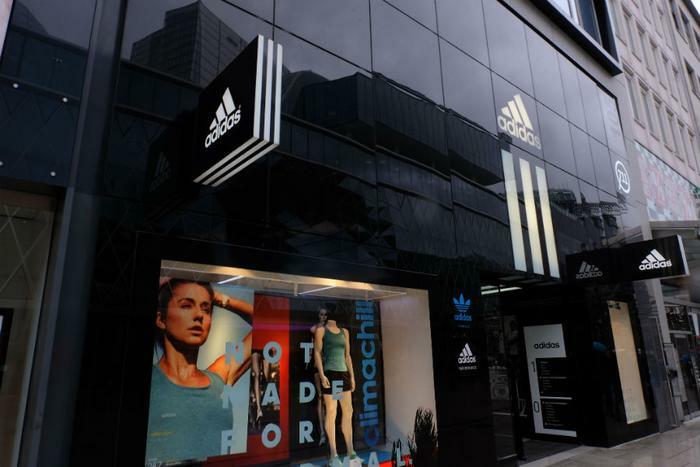 Adidas reported on Monday that it will be committing to only using recycled plastics by 2024. The company pledged to stop using “virgin” plastic in all of its stores, warehouses, offices, distribution centers, and retail outlets, saving an estimated 40 tons of plastic per year starting this year. Eliminating “virgin” plastic also includes polyester, a material popular in tons of Adidas products -- everything from sports bras to t-shirts -- because it absorbs sweat. Adidas also reported that its spring and summer 2019 apparel lines will contain over 40 percent recycled polyester. Additionally, the company is expecting an uptick in its Parley shoes -- shoes made out of plastic waste that’s been saved from ending up in the ocean. Despite representing only a small portion of global sales (with only one million pairs sold in 2017), the company is expecting sales to jump to five million pairs this year. The decision to use strictly recycled plastics shouldn’t come as a huge surprise to consumers, as last month Adidas made strides in the sustainability arena with the launch of its Parley Z.N.E. hoodie. “Parley is a global network where creators, thinkers, and leaders come together to raise awareness for the beauty and fragility of the oceans and collaborate on projects that can end their destruction,” the company wrote in a statement last month. Adidas is the latest company joining the global fight to reduce plastic waste. Earlier this month, Starbucks announced it would be eliminating plastic straws entirely by 2020. The coffee chain will begin phasing plastic straws out of all of its stores, with the transition expected to be complete by 2020. The initiative will eliminate more than one billion plastic straws per year. Instead of straws, the company will be using strawless lids for many of its cold beverages. While some beverages --including many blended drinks -- will have dome lids, customers will be able to use straws made out of paper or compostable plastic, but only upon request. Additionally, McDonald’s will be eliminating plastic straws from its U.K. and Ireland stores by next year. Earlier this year, the fast food chain announced it would be using paper straws at many of its U.K. and Ireland locations. The company said it would begin moving straws behind the counter and only offering them to customers upon request. The fast food giant has also set a goal to source 100 percent of its food packaging from renewable or recycled sources in all of its locations by 2025.